A few weeks ago, The Irish Times published my review of The Science Delusion by Rupert Sheldrake, the former Cambridge don and enfant terrible of science. Sheldrake was a prominent name in evolutionary biology in the 1970s but he has since become a controversial figure because of his espousal of disputed phenomena such as telepathy, precognition and extra-sensory perception. Overall, I found the book fascinating but flawed. I didn’t feel the author offered any real evidence for his central thesis: that a strict philosophy of materialism (the belief that all reality is physical in nature) has hindered progress in science and caused working scientific hypotheses to harden into rigid dogma. Most of the evidence offered for this contention consisted of a critique of the methods of science reminiscent of practitioners of the discipline known as science studies; almost no attempt was made to engage critically with these views or to explain why the scientific method has been so successful. I also found that some of the basic science was flawed, especially in the sections on modern physics. Most of the material cited as evidence for ‘scientific dogma’ was not drawn from the scientific literature, but from review articles in popular science magazines. Such publications offer only a superficial version of scientific theories and I would argue that many of the ‘dogmatic principles’ identified by Sheldrake are in fact open questions in scientific research. Meanwhile, I found the author’s own pet theory of morphic resonance a bit far-fetched. In essence, this theory posits that the fundamental constituents of nature are not matter and energy, but self-organising systems that resonate with their environments. In this worldview, atoms, molecules and cells are not unconscious material, but have patterns of behaviour and habits. Sheldrake uses this theory to examine whether the universe is alive, whether the laws of physics are habits that change and evolve, whether all biological inheritance is material, and whether the mind is really confined to the brain. He also suggests that the theory can offer an explanation for phenomena such as telepathy and precognition. Overall, these discussions were fascinating, especially the descriptions of experiments attempted to test the theory. However, the experiments are also highly controversial; indeed, a little research shows that in many cases, the results are hotly disputed even amongst the experimenters themselves! 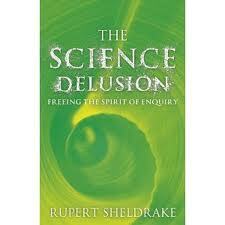 You can read my full review of The Science Delusion on The Irish Times website here. I was surprised to see that the book received rave reviews in both The Guardian and The Independent. However, neither review was written by a scientist. Indeed, there seems to be something of a culture divide here; Sheldrake’s views are enthusiastically embraced by people who know nothing of science, while scientists themselves are less impressed. Is that because we are fatally blinkered or could it be that we know what we are talking about? For the type of person who would fall for this book, should probably be clear about what you as a scientist think the answer to this question is. Hah! I guess the problem is that if I were fatally blinkered, I would never know it, would I ? When I googled the fascinating experiments described in the book, I found that, in every case where I could get information, the results are a matter of dispute amongst the experimenters themselves (not just amongst the community). This is a pretty shaky foundation for questioning the edifice of science. Quite apart from his own controversial experiments, Sheldrake’s discussion of scientific methodology shows a similar lack of interest in the concept of justification. Indeed, nowhere is a distinction made between the context of discovery and the context of justification – the latter being the real power of science from an experimentalist’s point of view. That’s the problem with all of this: that when you google these things, it becomes almost impossible to sift through all the stuff and make a good, confident decision on where to stand. Concerning the paranormal and Sheldrake, one of his biggest detractors – Richard Wiseman – later admitted that he got the same results as Sheldrake. He intentionally – it certainly appears to me – misrepresented what his study showed. The long and short of this is, assuming one’s unfamiliar with the step by step unfoldings, Sheldrake was honest, his study was significant, and Wiseman – professional “debunker” – was dishonest. There’s just no other way around this. Concerning other paranormal dealings, I suggest “Randi’s Prize” by Robert McLuhan (sp?). What makes this book good is that it pretty much follows my own and likely many other’s path: you hear something about a paranormal study that seems reasonable, sound, and significant. In other words, it really seems to lead one to think, “ok, it’s really possible something paranormal took/takes place.” Then you read something – having googled it – that seemingly debunks the whole affair. Then you later come across something pointing out a problem with the debunking. And it becomes impossible to really know: were the researchers honest? Were the debunkers honest? Do the statistics hold up? etc. With “Randi’s Prize,” he walks through how this happened to him . . . and it’s pretty damn convincing. I think it’s unfair to say the sheldrake ‘rejects’ the science – he is not rejecting any of the science, he is questioning the philosophy guiding the science and in some cases, interpreting the data. That’s his point, and I think he makes it well. To say he is rejecting anything (other than materialism as an assumption) is erroneous and not fair. Also, part of the problem here that appears to us outside the scientific institutions is Sheldrake would more than likely have a rebuttal to your article, and his rebuttal would, if we can base it historically on previous discussions, make sense. We need people like Sheldrake – this is not science vs superstition, it is materialistic philosophy vs a more holistic one. The scientific data doesn’t change, nor is it rejected, however it is interpreted in a more elegant fashion. your door opens directly onto the pavement or street.